Taste: Sweet, yet astingent with delicate tasting notes for fresh wood and smoke. Brewing instruction: In original South Americal way, with Mate gourd - Calabase and straw - Bombilla. Put about five to eight teaspoons of mate in Calabase. Calabases can be various sizes as they made out of naturally grown vegatable. For instructions giving, we are sticking to gourd within capacaty of 300ml. Pour cold water, about one forth of gourd and leave it for five minutes to steep. Dry leaves will absorbe water and swell up. Hot water about 70- 80 C should be added, filling gourd up till two thirds. Steep tea for short, about one minute and insert straw. After finishing first portion, we sugest add more water within 70-80 C and enjoy second and possibly third brew, which still has fairy good taste. Features&recomendation with food: Could be served as chill out drink in hot summer along with pleanty fruits and different snacks. Excellent after - party remedy. 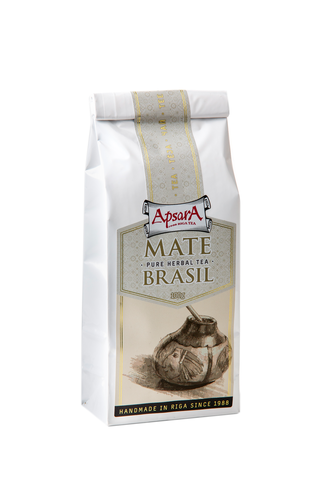 Product highligths: Mate originated in South American continent, where indigenous people prised as God`s drink. For indians Mate was provider of mild stimulant similar to coffee, tea and cacao. Mate, know botanicaly as Ilex paraguariensis, containing large amount of mateine which activating mental alertness, stimulating digestion, increasing blood preasure in same time reviving from depression and exhaustion. To produce Mate fresh leaves dried over fire. After firing leaves are cutted and sorted.